As a part of any moving or changing you home interior, furniture assemble or disassembling should always be done professionally and with no issues afterwards. 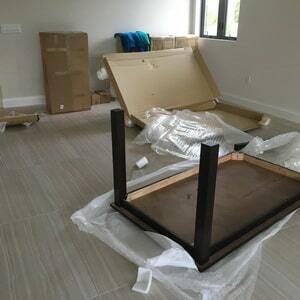 We, at Easy Florida Moving, do understand how important it is for you to have your stuff assembled properly. No matter if it’s something simple or complicated. Either the crib assembly or dining table, or just a chair. Whatsoever you can be sure, that every screw, bolt and nut is going to be tighten and there will be no extra parts that were not used if they had to be. You don’t need to worry if you are missing some of the screws or anything else, because we will try our best to find the spare part and assemble your furniture the way it should be. Besides all the advantages you will not be extra charged for the work we do. You will not pay up front and you are not going to be charged for the time that was spent on the way to your place or to/from shop if there any spare parts are needed. Only working hours are paid. Want Flat Rate? Schedule in-home estimate.